Port du Sud is located in the NE corner of Orphelina Bay. The marina provides slips for vessels from 8 to 25m and alongside wharfage for vessels up to 40m long. Depth of Marina 8 metres - but 4.5 m in some of the slips. Maximum yacht size 30 metres. Call Port Moselle Control on VHF channel 67 on approach to Noumea. Give them the name of your boat, the estimated time of arrival, and the overall length of the boat. Five minutes before arriving at the entrance to the marina call again to confirm your arrival. Maximum stay for foreign yachts is limited to one month. Power boats and shoal draft vessels with a height less than 10 metres due to an overhead wire. 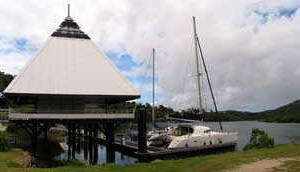 Marina du CNC - Cercle Nautique Caledonien is a Pirvate Yacht Club. - information - weather and shopping. Located in Boulouparis 34km NW of Tontouta International Airport. 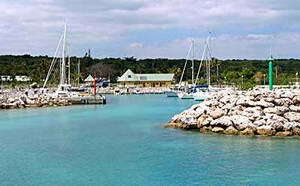 The entrance to the marina is in the Baie de St. Vincent at 21° 54.400'S, 166°03.794'E. 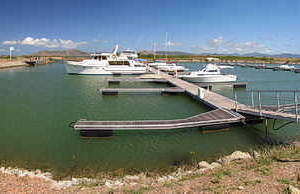 The marina and entrance is dredged to 1.5m depth at low tide. Extra rate for living aboard 340 CFP per day or 7100 CFP per month. The marina is 2.5m deep at spring lows and is a bit small for an ocean going yacht. The approach depth is 2.5m at low tide throughout. 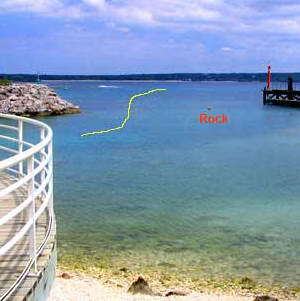 Photo showing entrance to We Marina depth 11ft Kim Milligan "RAM" 2005. The We Marina is on the east side of Lifou and the harbour is a man made breakwater with a large pier for the interisland ferry. 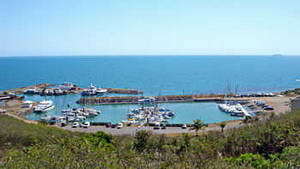 The marina is shoreward of the ferry wharf. The turn into the marina is sharp - stay to the north side of the channel - and the marina inside small. Least draft in the entrance and in the marina slip is 2.5 m at low tide. Yachts exceeding 45 feet must be very careful entering this marina and all vessels should call ahead on VHF to alert the staff so they can lend a hand with lines and give instructions on where to berth. Yachts must clear in to Noumea before visiting Lifou. If a yacht (or yachts) wish to enter or depart from Lifou the yacht(s) must notify Immigration in Noumea at least a week in advance and pay for an immigration official to fly round trip to Lifou plus all expenses, including hotel and meals. Photo showing inner entrance - stay to starboard. Depth in slip 8 ft.